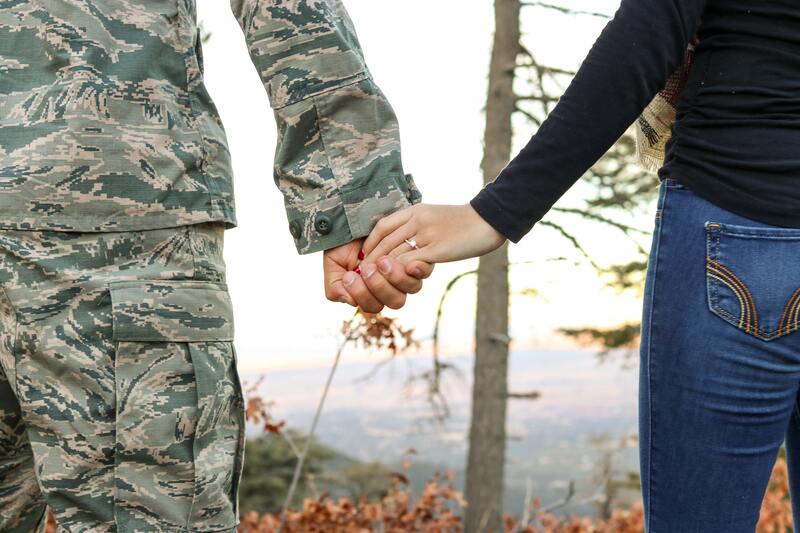 “One day closer” is a common phrase for the spouse of a deployed military member. This is the case for many of my friends and me, right now. My story is a whirlwind deployment situation. Though my husband and I knew the deployment was coming, we had a lot happen right around the time he was leaving. After almost 5 years of dating, we decided to get married 6 weeks before he was shipped off. We also moved to a new house the week after he left! Plus the holidays hit within the first 6 weeks of him being gone. Talk about emotional torture! Though the length of deployment may seem “short” in the grand scheme of things, it is anything but brief. The days blend and the nights become sleepless. Oh, who am I kidding? They started sleeplessly and have not changed. The hours seem to pass more and more slowly as his deployment continues. Every “How are you holding up?” and “Is everything going ok?” brings tears to my eyes or chokes me up as I swallow hard and reply, “We are just fine.” I am trying to show my kids that I am strong and can keep it together (biggest challenge ever by the way). When I add in a 40 hour work week and homework for 4+ children, you would think the time would fly by. Unfortunately, staying busy does not keep me from feeling that twinge in my heart. Let me break down a typical day to put this in perspective. 0430: alarm goes off, and it all begins. 0700: Deployed husband is getting off work and able to text for a little bit before he goes to bed. We take advantage of as many chances we can to talk, thank goodness my company is so understanding. 0730-1000: While texting and working, it’s now time for my deployed husband to go to bed. Good night and I love you’s said; I return to work with sadness. 1200-1230: Lunch break. Hopelessly check text to see if he happens to be still awake. 1525: Arrive home and greet children from school. Snack before homework starts. 1545-1615: Homework with a 1st grader and assisting a 3rd grader. 1615-1630: Finish the 3rd graders homework and review 5th graders while realizing my husband is waking up and will be calling soon to say hi to the kids. 1630-1700: Reading time for 1st, 3rd and 5th graders and help 8th grader with her homework while starting dinner and dealing with meltdown #1. 1700-1745: Finish cooking dinner, eat quickly and try to start cleaning up before husband calls. Talk to my husband, pass the phone around to each of the kids so they can tell him about their day, and buffer a fight between 2 of the kids. 1745-1830: Say goodbye to hubby and wish him an awesome day, finish cleaning up dinner, deal with meltdown #2, start someone’s laundry. 1830-1930: Kids play on tablets, board games or watch TV until someone has meltdown #3 causing mom to question her sanity and have everyone clean up and brush teeth. 1930: 3 out of 4 kids in bed. Oldest does her thing to wind down as teenagers do. Mom switches laundry, so whichever child didn’t have clothes will have something to wear tomorrow. 2100: Oldest child goes to bed. I turn on the TV for some background noise to keep me company. 2100-0130 maybe 0230: Toss and turn, watch tv that I am not paying attention to until I finally turn off my mind enough for a few fleeting hours of sleep to start it all over again. I often hear from people, “you got this” or “you’re doing a great job.” That may be the case, and we completely and utterly appreciate that it looks that way from an outside perspective, but full disclosure, I don’t. I am exhausted. I am confused. I fill our weekends with activities that I don’t know how I am going to get through to keep kids entertained, so they don’t get sad and miss him too much. I can’t speak for every military spouse, but if I didn’t write everything and I mean EVERYTHING down, I would forget to take out the trash or go to the bathroom. Though it may seem more natural as the months go on, I feel I am becoming numb. Numb to the fact that I have made it through another day of work, another argument between children, another 3 hours of sleep when I pray for 4. I say all of this because today I sat in my cubicle and cried most of the day at nothing. No trigger that I can say brought it on. Nothing that I can pinpoint to prevent it from happening tomorrow. Just a blubbering mess all day. The moment I seemed to pulled myself together, it would start all over again. Deployment is rough. I love my spouse and would do anything for him. I do all of this with a smile. But please don’t forget, behind every smile is an exhausted, emotional spouse, ready to crack at any moment. If you find a military spouse in one of those moments of weakness, please know, we are trying our best. We have put on the smile and held it together as long as we could. Just hug us, hand us some chocolate and wine, and back away slowly. Always remember, choose your words wisely and approach a military spouse with a partner on deployment with caution. Jessica Hollyfield lives in Utah with her husband and six kids. She is a working mom and military wife.